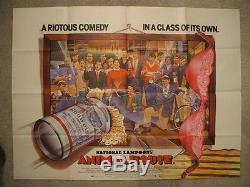 UP FOR SALE IS A 1978 ORIGINAL FOLDED BRITISH QUAD MOVIE POSTER FOR NATIONAL LAMPOON'S ANIMAL HOUSE. IT MEASURES 30X40 INCHES AND IS IN C8-C9 EXCELLENT - NEAR MINT - UNUSED CONDITION - A VERY HARD TO FIND ORIGINAL. PLEASE CHECK ALL PICTURES - HAND SELECTED , THE FINEST EXAMPLES - INVESTMENT GRADE. BE ASSURED THAT ITEMS WILL BE PROPERLY PACKAGED WITH EXTREME CARE. SHUTTERISLAND ORIGINAL VINTAGE MOVIE POSTERS. 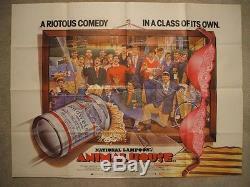 The item "ANIMAL HOUSE 1978 ORIGINAL BRITISH QUAD MOVIE POSTER NATIONAL LAMPOON'S EX-NM" is in sale since Thursday, August 22, 2013. This item is in the category "Entertainment Memorabilia\Movie Memorabilia\Posters\Originals-International\1970-79". The seller is "shutterislandovmp" and is located in Minneapolis, Minnesota. This item can be shipped to United States, Canada, United Kingdom, Denmark, Romania, Slovakia, Bulgaria, Czech republic, Finland, Hungary, Latvia, Lithuania, Malta, Estonia, Australia, Greece, Portugal, Cyprus, Slovenia, Japan, China, Sweden, South Korea, Indonesia, Taiwan, South africa, Thailand, Belgium, France, Hong Kong, Ireland, Netherlands, Poland, Spain, Italy, Germany, Austria, Israel, Mexico, New Zealand, Philippines, Singapore, Switzerland, Norway, Saudi arabia, United arab emirates, Qatar, Kuwait, Bahrain, Croatia, Malaysia, Chile, Colombia, Costa rica, Panama, Trinidad and tobago, Brazil, Guatemala, Honduras, Jamaica, Bahamas, Viet nam.